QUBES (Quantitative Undergraduate Biology Education and Synthesis) and Biology Students Math Attitudes and Anxiety Program (BIOMAAP) are excited to offer an online Faculty Mentoring Network in Spring 2019. Participants will explore a range of tools to address math attitudes and anxiety, and will implement BIOMAAP materials in their spring biology courses. Apply by December 1, 2018. Visit https://qubeshub.org/groups/biomaapfmn2019 for more details or to apply. The Biology Students Math Attitudes and Anxiety Program is a resource for educators who are looking to implement non-invasive techniques to change student attitudes and reduce anxiety towards math. Get started with our resources. "If I had to describe BIOMAAP to someone I would say that it is about doing activities that help you feel more secure about math." Many instructors face real challenges when teaching quantitative topics in biology - their students can be fearful, disconnected, and disengaged. These student responses are not surprising given the negative experiences many had as children. BIOMAAP aims to help undergraduate biology majors improve their attitudes and decrease their anxiety towards mathematics, and thus to help faculty teach quantitative topics in biology. BIOMAAP materials can be easily added to existing courses and curricula. Interventions can range from a few short outside of class activities, to weekly in-class faculty- or peer-led activities. BIOMAAP offers resources to help biology students overcome their fears and engage with the quantitative content that is often a stumbling block to persisting in STEM. "I would freak out before tests and these activities helped me to stop overthinking math." 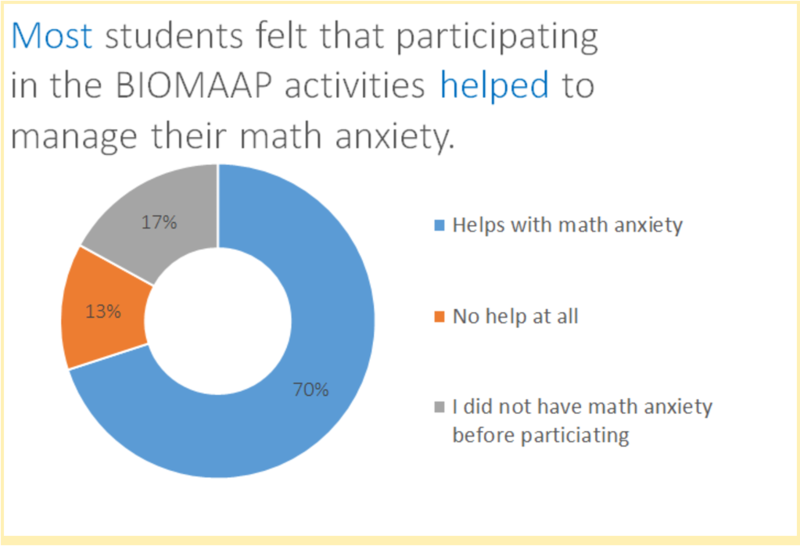 "I understood that these BIOMAAP activities were going to be about math anxiety, but I didn’t feel like I had it. I was always an accelerated math student in school. But doing these activities made me realize that I had a ‘go to’ method for solving problems that made me anxious. I learned to think about other ways of solving problems." "I would describe this as self-help for anxiety-not just for math. The activities will help you learn the basics of a growth-mindset." "Another activity that I really liked was the reflective writing before tests. She had us write down everything that was bothering us before the test. When I saw it on paper I thought, ‘Why was I worried about that?’ and she continued to do that before every test and it is really helpful."